Interested in Trustee/Foreclosure Sale (also known as TPS) properties? Use our advanced search filters to find your next property. Begin with your basic search criteria. Type your city, state, zip code or address of interest to begin. Please see the example below for Georgia. Once you do this initial search we can use the advanced filters to look at only TPS properties in Georgia. Click on the icon on the right of the tool bar for the drop down of filters. Now that you can see all the filters, choose “Trustee/Foreclosure” under “Program” and click “Apply”. 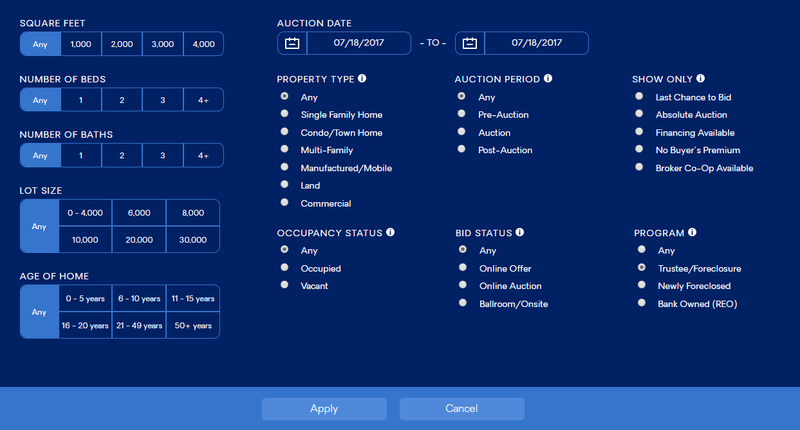 A new Search Results Page will populate with all of the Trustee/Foreclosure properties on our platform in Georgia.